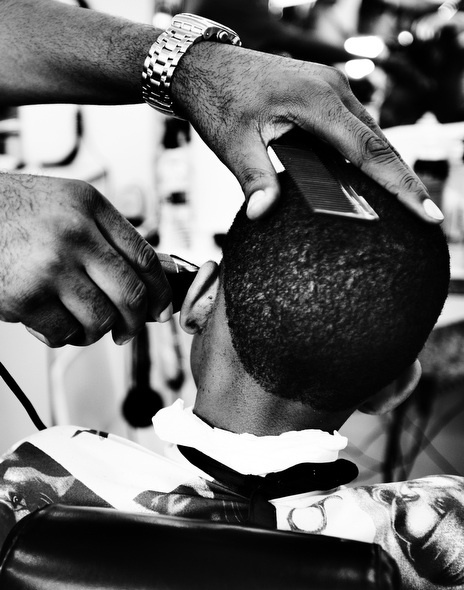 Saw this wonderful blog post about Harlem barbershops on CNN. I rarely reblog other folks contents. However, the photos by Photographer Melissa Kirschenheiter are so wonderful, I had to share here. Enjoy! For months, on her way to the laundry mat, Melissa Kirschenheiter passed a barbershop in New York’s Harlem area. She noticed barbers and customers drinking beer and listening to music and was intrigued. After asking permission to photograph the shop and its clients, Kirschenheiter began a two-year project, visiting that shop and others for half-hour increments on Friday and Saturday night. At first they were hesitant to let her in the door, but after her first visit, she returned to show them photographs she made. They were pleased and welcomed her, and she felt like she formed friendships with many of the regulars.